If you’re looking for a Kaysville Moving Service, Moving Connections is a Moving Company offering the best moving help in Utah. While Moving Connections is a professional moving company – we are federally licensed, bonded, and insured – we are also very affordable and we even offer a cost-saving “Labor Only Move” as one of our residential moving service options. We also offer a whole range of ancillary moving services, such as staging homes or providing climate controlled storage space. If Moving Connections is moving you to Kaysville it's a perfect time to begin to utilize the many resources and bounties of Kaysville. For example click on the picture to the left to go the Moving Connections 'Support - Advice - Assistance' page and discover Kaysville for the first time. Once you are on the 'Support - Advice - Assistance' page go ahead and open the .pdf link found there and tape the list of emergency and useful phone numbers on your refrigerator. 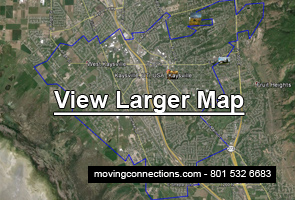 Moving Connections has gone to great pains to find those links and connections to integrate you quickly into Kaysville life. Moving Connections is your Kaysville full service professional moving company. We provide all the services you might need from a residential mover, including staging and storage services, as well as car shipping services and other services. With the most professional moving crews, Moving Connections has attained a level of performance in the moving service that is unexcelled. And since we are federally licensed, bonded, and insured, you can be assured that we are in business for real. The most amazing thing about this level of service is that Moving Connections provides it at a very competitive, affordable rate. And if you want an even better rate and you have a Do-It-Yourselfer spirit, check out our “Labor Only Move”. A “Labor Only” move is a move in which the customers provide the moving truck and the driver. This is usually in the form of a rental truck being driven by the person who is moving. We at Moving Connections offer this service to alleviate some of the cost of moving by having the customer do the driving and unloading. This significantly reduces the number of hours of labor that our crew has to perform, so your bill is reduced proportionally. Our Kaysville Labor Only crew will still blanket, pad, and stretch wrap your household goods, and then load them on the truck according to industry standards. Then you can drive the truck to your new home and unload it there yourselves. This saves you a lot of money because we don’t have to drive the goods to their new home and unload them there. But the Moving Connections crew still does all the heavy lifting and loading, and provides expertise.